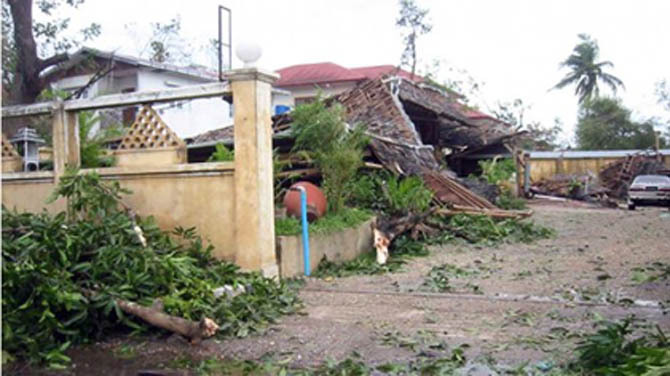 A house destroyed by Cyclone Nargis in Rangoon in 2008. WASHINGTON—Global warming is leading to such severe storms, droughts and heat waves that nations including Burma should prepare for an unprecedented onslaught of deadly and costly weather disasters, an international panel of climate scientists says in a report issued on Wednesday. The greatest danger from extreme weather is in highly populated, poor regions of the world, the report warns, but no corner of the globe—from Mumbai to Miami—is immune. The document by a Nobel Prize-winning panel of climate scientists forecasts stronger tropical cyclones and more frequent heat waves, deluges and droughts. In the past, the Intergovernmental Panel on Climate Change, founded in 1988 by the United Nations, has focused on the slow inexorable rise of temperatures and oceans as part of global warming. This report by the panel is the first to look at the less common but far more noticeable extreme weather changes, which recently have been costing on average about US $80 billion a year in damage. “We mostly experience weather and climate through the extreme,” said one of the report's top editors, Chris Field, an ecologist with the Carnegie Institution of Washington. “That's where we have the losses. That's where we have the insurance payments. That's where things have the potential to fall apart. A country that was not as prepared, Burma, was hit with a similar sized storm in 2008, which killed 138,000 people. The scientists say that some places, particularly parts of Mumbai in India, could become uninhabitable from floods, storms and rising seas. In 2005, over 24 hours nearly 3 feet (1 meter) of rain fell on the city, killing more than 1,000 people and causing massive damage. Roughly 2.7 million people live in areas at risk of flooding. Other cities at lesser risk include Miami, Shanghai, Bangkok, China's Guangzhou, Vietnam's Ho Chi Minh City, Burma's Rangoon (also known as Yangon) and India's Kolkata (formerly known as Calcutta). The people of small island nations, such as the Maldives, may also need to abandon their homes because of rising seas and fierce storms. “The decision about whether or not to move is achingly difficult and I think it's one that the world community will have to face with increasing frequency in the future,” Field said in a telephone news conference on Wednesday. This report—the summary of which was issued in November—is unique because it emphasizes managing risks and how taking precautions can work, Field said. In fact, the panel's report uses the word “risk” 4,387 times. The study says forecasts that some tropical cyclones—which includes hurricanes in the United States—will be stronger because of global warming, but the number of storms should not increase and may drop slightly. Study co-author David Easterling of the National Climatic Data Center says this month's heat wave, while not deadly, fits the pattern of worsening extremes. The US has set nearly 6,800 high temperature records in March.